The same day David moves into a halfway house after witnessing a traumatic event, one of the house mates is brutally murdered. When people in the house begin to suspect David, he sets out to discover who the real killer is and prove his innocence. 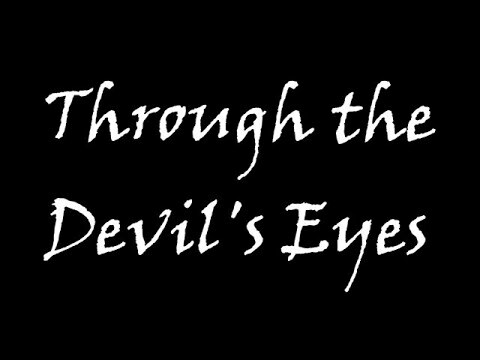 Through the Devil's Eyes is a Giallo inspired, slow burn mystery filmed on a reported $1,500, so it's super low budget. Probably more like no budget. But given that budget and severely limited resources, the end result is technically very impressive and story wise a solid little film. Writer/director RJ Cusyk creates a tense atmosphere full of fleshed out characters, each displaying individual personalities and quirks. Through the Devil's Eyes was able to overcome its micro budget because of the strong script and characters. On a technical note, the grainy look really set the tone of the 1980's and gave it a legit VHS feel and the sound quality was excellent, better than other indie horror films I've seen with probably 50 times the budget as this film had. The film would have benefited from more wide shots or establishing shots when the location or scene changed, it would have added a stronger sense of location and environment, especially in the beginning when David arrives at the halfway house. There are a lot of up close and tight shots on the characters and their surroundings, I would have liked seeing some of the spaces opened up a bit more. The markings of a Giallo are all here: a mysterious killer wearing black gloves, anyone possibly being a suspect, brutal kills and bloody deaths, and the focus being on an independent investigator as opposed to the police. In this case David, a suspect, works as the investigator. I believe the deaths could have been a bit more graphic here, splattering a little blood on the wall goes a long way as far as gruesome deaths are concerned. The kills are deemed gruesome by some dripping blood here and there and the amount of blood on the killer's knife. Regarding the story I give the filmmaker credit for paying attention to the tropes of a Giallo and making them as evident as possible. Through the Devil's Eyes is a love letter to the Giallo sub-genre and while the budget definitely held back the blood and gore factor, the script did a good job at conveying the spirit of a Giallo film. It's a character driven mystery sparked by an incident that sends David to the halfway house, an incident that is brilliantly played out and built up throughout the film little by little until it is ultimately revealed. The acting is solid enough all around with some displaying stronger abilities than other. Tristan S. Bradford who plays Jonathan did an excellent job here, he has a real natural way about the way he speaks that made him seem very in the moment and had him stand out amongst the cast. In the end I was pretty impressed with what Through the Devil's Eyes was able to deliver: a solid mystery that paid accurate homage to its source inspiration. Thank you so much for your positive review! It means a lot. I'm glad you liked the film. I posted the link on Through the Devil's Eyes imdb page. It can take up to 14 days to be on there. You're very welcome! Thanks for letting me review it.